I recently had the opportunity to try out a new App called Dabby Dill & the HICCUP Pickle. Now, I have to confess with the name Dabby Dill I was wondering where the Pickle fit in. You know, like a dill pickle, but that is not the kind of pickle we are talking about. Dabby Dill goes to bed one night and gets herself in a pickle, or a jam, or a little bit of a problem. Just before she goes to sleep she gets the hiccups, thus the hiccup pickle. Poor Dabby tries all sorts of ways to rid herself of the hiccups, all to no avail. Until...well, I don't want to spoil the story, so I will stop right there. Wait until, you see the many things Dabby does to try and get rid of her hiccups. 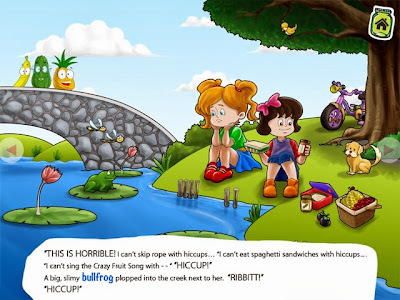 The Dabby Dill & the HICCUP Pickle App is a cute story that can be read in three different ways. The App will read the story out loud to your child. You can choose the read along option where the story is read out loud, but as each word is spoken it is underlined for your child to follow along. Then of course they can choose to read it by themselves. Last of all there is a game to play. Your child has to follow a pattern of sounds made by four different characters. Simple, yet fun! 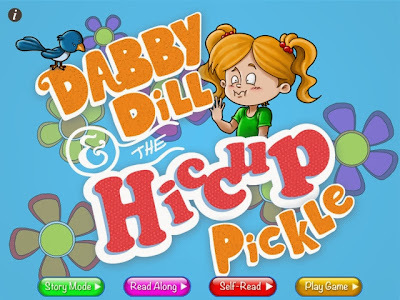 You can purchase the Dabby Dill & the HICCUP Pickle App for $2.99. You can also enter the giveaway here, where we have five codes to giveaway! Do you have a daughter or maybe a granddaughter or niece who loves dolls? Then you need to visit the Doll Clothes Superstore with us! We received the most adorable outfit from them for my daughter's doll. Now, most little girls like dolls, but they also like doll clothes! The first thing my daughter used to do with all her dolls was undress them and put them in some new outfit. even when she liked the outfit they came in, she just had to try something new. Well, I don't know how you feel, but doll clothes can be pretty expensive and I don't want to feel like I am dressing another child, so I want to share with you a little bit about the Doll Clothes Superstore. Their prices are really reasonable and they are well-made. We chose the American Girl Doll Colonial Dress, Hat and Pinafore ($10.25). Isn't it nice? My daughter really likes the old fashioned dresses. It fits her doll perfectly. Most of my daughter's dolls are the size of American Girl Dolls. She has a few others, but prefers this size. The Doll Clothes Superstore carries clothing for American Girl Dolls, My Twinn, different size baby dolls, Barbie and Ken and even stuffed animals. You can search their website to see if they carry clothing in the right size for your child's doll. They even have matching clothing so your child can dress in the same outfit as their doll! Accessories, like shoes, socks, tights, eyeglasses and jewelry can be found at the Doll Clothes Superstore. Now, for my readers we received a code so you can receive receive 10% off any order. No minimum required. Just use the code "atthefencedcs". Using this code will give you a discount on any purchase you make. Even if you aren't purchasing something now, take a minute to check out and bookmark their site for easy access at a later time. Be sure to look at their Scratch and Dent Sale while you are there for some GREAT bargains. Oh, and follow them on their social media! Thanks for stopping by today At the Fence! See you soon! I need to apologize for not posting as much the last two weeks. We actually have company visiting. As you all know there are 8 in my family, and the family that is visiting is 9 plus they brought one extra person with them. Now, they are not staying in our home, they are actually renting a cabin a short distance away. That has not stopped us from visiting almost daily and of course the children running around together. My four youngest, ages 13-20 are each one year apart from her four oldest. They have been playing indoor volleyball (at the Y) and getting together to eat out. We also took a trip to a shopping area two hours away. Yes, all of us! We took three vehicles, because a few of mine needed back for their TKD class. Needless to say, the ones who didn't come back when we did ended up stuck there all night. We had to pay for three rooms because of a snowstorm. Anyway, all of that to say, a new post will be going up today and starting Monday we will be back to our normal schedule. Thank you for your understanding. All winners have been chosen and notified. Also, on a side note we will be doing our Petacular event starting in February and let me tell you, we have some really nice sponsors lined up. We are doing this event with Hope's Cafe and PI of Products. I will still have some regular posts also, but this event will center on pets and all kinds of products to use on and with them. Be sure to check in as we are going to have a special announcement regarding the event next week. We are also planning to work together on a cooking or kitchen event, probably in April, Doesn't that sound good? Thanks for stopping by and I'll see you soon, At the Fence. I think I am ready for spring. We are presently experiencing another cold snap. It went from 25 this afternoon and now it is 7 and feels like -14. Tomorrow we are actually going to reach 9. Nine degrees! That is with a wind chill of -20. 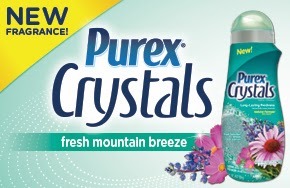 I mean you walk out of your home and your nostrils freeze. What type of weather are you experiencing? I am sure there are some who are having it much colder than here. Of course my southern friends think it is cold when they hit anything below 40. My family has decided that once it reaches this cold, it is just plain cold. It really doesn't make mush difference if it is -20 or -30, it is just cold. We were in northern Maine for a winter and we actually had a whole month that never got above 0. The one day we had to travel a few hours, it was -40 with a wind chill of -75 wind chill. Now, if that wasn't bad enough the rear window of our Suburban went down for loading, but wouldn't go back up. So we traveled several hours in this weather all eight of us in the front seat and the second seat wrapped up in heavy winter clothing with blankets wrapped around us. We were headed south, so after 3-4 hours the window finally went up. Needless to say we unloaded without lowering the window and of course re-packed the same way. What is your cold weather story? Share one in the comments and perhaps we can do a post sharing some cold weather experiences. Have a great night and stay warm wherever you are! Looky, looky! 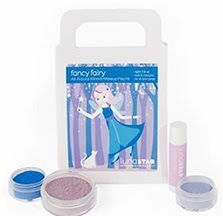 We added some new items to our Gift Box giveaway! We will be adding a new entry also. This is going to be really simple. All you have to do is visit our new photo site and leave a comment on one of the posts. You can visit the site HERE. I will be verifying that this was done. You can visit the original post for the Surprise Box to enter, HERE. Now, here is what we have added. A Purple Taupe Nail Polish- very pretty. Keep checking back for new additions! See you soon, At the Fence! As you know we are going to be focusing on fun things to do for a Family Fun Night. As a general rule I don't think of computer games as something you can do for a family fun night, but I have to tell you, years ago my two older daughters and I used to do mystery games together for fun. We would have snacks and all sit together and figure out the puzzles and clues. It was actually quite a bit of fun and we were interacting not just sitting there in a stupor. Big Fish Games has some excellent games for this type of activity. Some are seek and finds and of course they have some mysteries too. The DinerTown family is growing! Join Flo and the cast in Avenue Flo: Special Delivery, the sequel to the quirkiest Adventure game ever. Vickys due date is fast approachingand so is the baby shower extravaganza Quinn is planning. Run across town with Flo, collecting missing items for the DinerTown characters in need, in order to save the towns highly anticipated celebration and become a hero! Big Fish games is constantly running specials. They have PC games, Mac games, online games, iPad and iPhone games along with Android games. It is extremely easy to purchase and download games. Many of the games have a short trial period where you can do a quick trial run and see if you will really like the game. Big Fish Games also gave us two codes to giveaway, So, 2 neighbors will each receive one code for a free game!